I had an old terracotta planter that I wanted to reuse and thought that it would be perfect for creating a jack-o-lantern face. I wanted him to look afraid of my other Halloween decorations so I planting tall grass in the pot to give him more of a scared look. 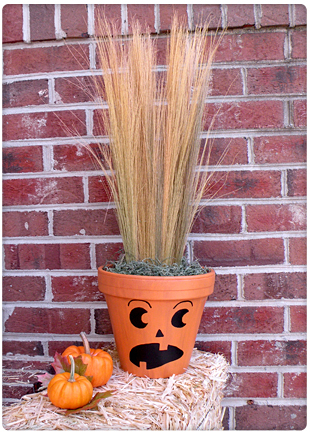 You can also put mums or other fall flowers in the planter if you want to create a kooky face with fun hair. Place the planter on a small bale of hay, add some mini pumpkins and you have a perfect decoration for fall. This entry was posted in Crafts, halloween, reuse, reuseable and tagged Gina Tepper, halloween, halloween crafts, halloween decorations, jack-o-lantern face, painted jack-o-lantern, planter, terracotta planter, terracotta pot. Bookmark the permalink.